Quite spooky. Not sure I'd like it in our garden! Only saw "Heligan" programmes on television - your photographs are really interesting. Wow, I love the hair. Have you finally found Cluelesskev ??? LOL. Great pic. I love it. Wow..., how creative, I love it! I've seen this in my book of Green Man images,always rather liked this one. 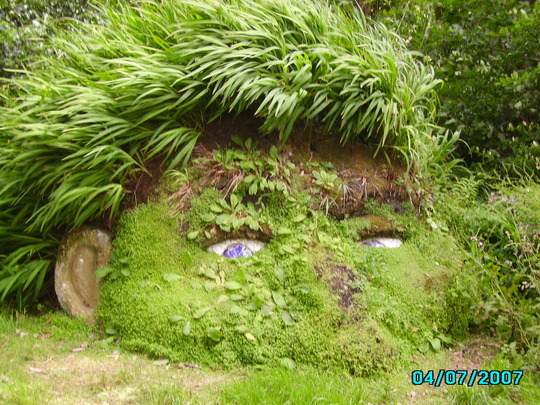 I had a Chia head and pasted seeds on the face too, it looked pretty cool when it grew, wish I had a photo. I have just had and idea I'm going to buy a clay garden ornament and paste seeds to it. If you do it PF please let us see the finished results , I,ve never heard the expression .....".paste seeds to water "......... do you put some soil on first and then sprinkle with water ? I think these are fantastic! Unfortunately, when we visited March 2008 it was a horrible wet, windy day but I was determined to see everything anyway and I got some photos of these grassheads.